KAK INDUSTRY "FLASH CAN". 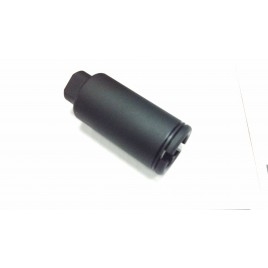 THIS IS A SOLID 6061 ALUMINUM DEVICE THAT IS DESIGNED TO DIRECT MUZZLE GASES AND THE MUZZLE FLASH FORWARD. BLACK MILITARY TYPE HARD ANODIZING. THIS DEVICE IS NOT DESIGNED TO REDUCE RECOIL, MUZZLE RISE, OR FLASH SIGNATURE. THIS DEVICE IS DESIGNED TO DIRECT GASSES AND NOISE FORWARD AWAY FROM THE SHOOTER AND ENHANCE THE WEAPONS APPEARANCE.. THIS MUZZLE DEVICE DOES NOT USE A CRUSH WASHER AND SHOULD BE TORQUED DIRECTLY AGAINST THE BARREL SHOULDER..